This multi-generational game educates and empowers girls about advertising and argument. 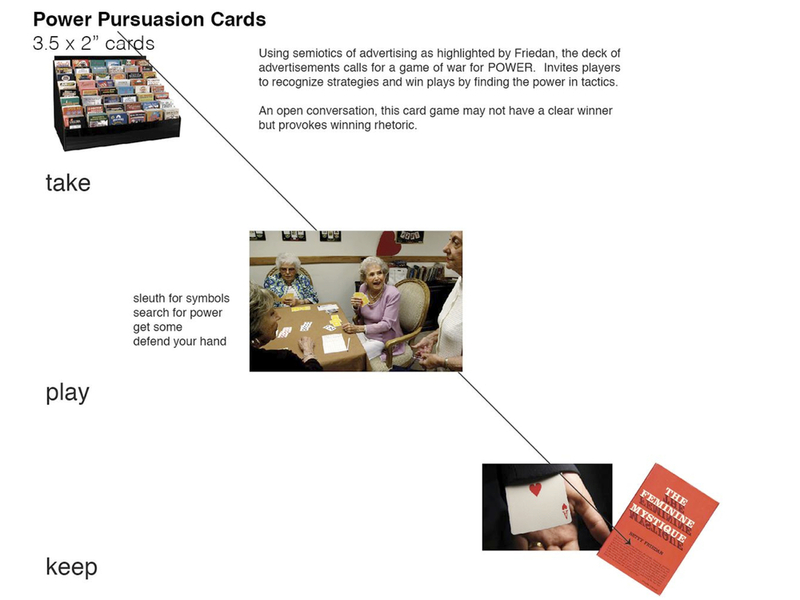 Using advertisements from the 60's, this card game lets players pick and choose their own argument and narrative to "claim power" in this game of semiotic war. Using clues from the images on each card, one must create a narrative that explores how their images have power. With some cards clearly un-empowered (this is the 60's, after all) the argument is at times ludicrous, but brings out the story-teller and tall-tale spinner in young and old alike. This game was created in collaboration with Kristin Bergman, and exhibited at the Shelia Johnson Gallery on 5th Ave of New York City.